New Mexico Home Builders Association (NMHBA) is a 1,900+ member trade association that was chartered with the National Association of Home Builders in 1959 to improve conditions in the construction industry, thereby providing the citizens of New Mexico with safe, quality housing. Homeownership is the cornerstone of family security, stability and prosperity. It strengthens our communities, encourages civic responsibility and provides a solid foundation from which New Mexicans can work to support their families, enhance their communities and achieve their personal goals. The value of housing and homeownership to New Mexico and its people just cannot be overstated. The Construction Industries Division (CID) has completed its current round of amending the 2015 New Mexico building codes. The structural codes may be used now, or permits may be obtained under the 2009 building codes until June 30, 2017. NMHBA is in the process of amending the 2015 NM Energy Code. The 2009 Energy Code is the only version allowed in the state at this time. 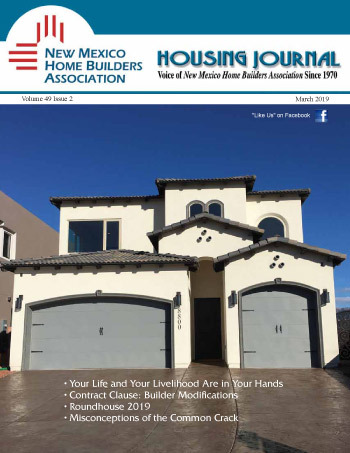 For many years New Mexico Home Builders Association has prepared Issue Statements to clarify its position on topics of interest to the construction industry. Through the years these Issue Statements have provided guidance for NMHBA lobbying efforts during Legislative Sessions at the Round House.